Induction fluorescent signs feature Sylvania's Quicktronic ICE system. The result is an extremely bright and reliable sign. Southern is the only manufacturer of internally illuminated street name signs to offer an induction fluorescent sign. 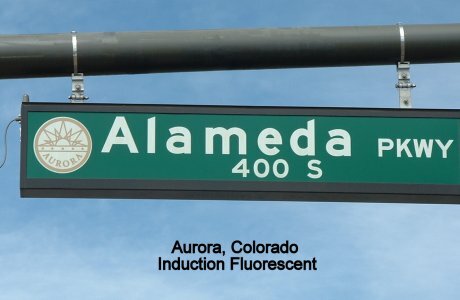 This sign was developed in partnership with Aurora, Colorado in 2006. The sign and Quicktronics ICE induction system have proven to be reliable through the cold winters and hot dry summers on the high plains east of Denver. Induction signs are the brightest IISNS on the market as each lamp is rated at 8,000 lumens. 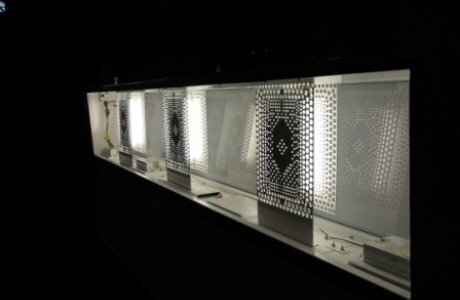 An 8' sign has 3 lamps; thus, it is rated at 24,000 lumens. The .125” gauge aluminum body is continuously welded for superior strength and weather protection that can withstand winds of 110 mph. Polycarbonate lenses and films are specifically designed for outdoor use and are engineered to hold up to UV rays. In addition to standard green and blue backgrounds, signs can be built with retroreflective backgrounds. In addition to improving visibility, Southern's signs can help set a community apart. Our advanced CAD system can reproduce any logo, and the powder-coated housing can be painted to match the color of the mast arms to compliment the streetscape of any city.